Department of Health (DOH) will be having a National Health Summit starting from Sept 15 that will take place at Philippine International Convention Center (PICC) at Pasay City entitled “Duterte Health Agenda” and this event aims to help poorest Filipinos in the country. During a press conference at the executive department’s Media Relations Unit, DOH Sec. Dr. Paulyn Ubial revealed that the event will highlight the promises of Duterte administration to achieve better health conditions, life longevity in a healthy way and prevent premature death. Mandatory check-up will start after the launch of Health Agenda to detect various ailments among 20 million poorest Filipinos and the effect will measure on Christmas Day to be exact. Basic check-up includes urinalysis, cervical cancer screening, physical examination, breast cancer check-up and many more. Ubial released a number of illnesses that can be detected by basic check-up such as renal problems, Vitamin A Deficiency, and hematologic conditions. She also hopes that the poor Filipinos will avail the basic check-up as part of their main goal. The National Health Summit will also conduct the E-Health System tools to fortify the local health services and give full support to implement the Duterte Health Agenda. Dr. Ubial reiterated that they won’t achieve their goal without the help of several stakeholders and local partners insisting that there help will be pivotal to have a quality health service for the poor. 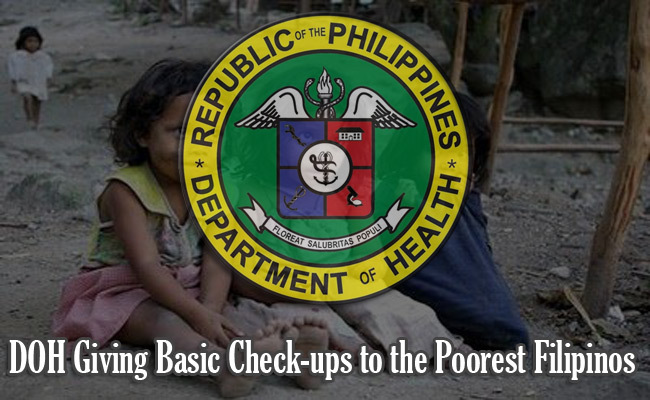 Department of Social Welfare and Development (DSWD) will identify the poor citizens who are under the poorest sectors who deserve a better health outcome. This agenda was first mentioned by the Duterte Administration on their 10 point Economic Agenda. Senator Risa Hontiveros who was also present at the press conference is hoping that summit will be an opportunity for the government to discuss its health policy compositions and our nation’s drug problem.